Digital game play is the human-computer interface in its purest form; people play games in order to experience interfaces. 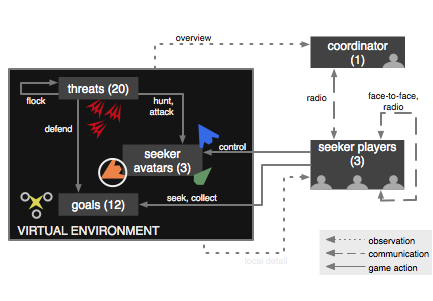 My research develops gameplay through which participants practice real-life skills, with an emphasis on disaster-response contexts and team coordination. My work incorporates ethnographic approaches to understanding existing practice; zero-fidelity simulations that capture abstract, human-centered aspects of practice; mixed reality computing that engages players in human-human, human-environment, and human-computer interaction; and mobile, collaborative technologies that support sensemaking in disaster. My research thus lies in and around the intersection of human-computer interaction, games, mixed reality, and disaster response. Further research interests include serious gaming, game mechanic design, sensor-driven interfaces, team coordination, ethnographic approaches, and signal processing. My dissertation and ongoing research project involves working on the Team Coordination Game (TeC). TeC iteratively develops zero-fidelity, non-mimetic simulation mixed reality game designs for studying and enhancing the team coordination capabilities of emergency responders. An ethnographic study with the Brayton Fire Training Facility informs the designs. Game user studies with fire emergency response students evaluate its effectiveness for teaching team coordination. A component of TeC research develops an ergonomic wearable computing platform with head-mounted display, orientation and location sensors, and radio communication. I have previously done research and engineering at the Texas A&M Center for Applied Technology working on information dashboard interfaces, and the TEEX / TEES Crisis Response Innovative Technologies Lab (at the Disaster City Emergency Ops Training Center), where I worked in disaster sensemaking. I maintain a research relationship with my advisor, Andruid Kerne, at the Interface Ecology Lab. I previously interned at the Yahoo! Research Internet Experiences Group with Elizabeth Churchill and Ayman Shamma investigating the use of mobile devices in shopping. Toups, Z. O., Hamilton, W. A., Kerne, A. Zero-fidelity simulation: Engaging team coordination without physical, functional, or psychological re-creation , accepted to Proc. MODSIM World 2011. Hamilton, W., Toups, Z. O., Kerne, A. Synchronized Communication and Coordinated Views: Qualitative Data Discovery for Team Game User Studies, Ext Abs ACM Computer Human Interaction 2009, Boston, Massachusetts, USA, April 4–9, 2009, 4573–4578, [DOI:10.1145/1520340.1520702]. Toups, Z. O., Kerne, A., Hamilton, W. Motivating Play through Score, ACM Computer Human Interaction 2009 Workshop on Engagement by Design, Boston, Massachusetts, USA, April 4–9, 2009. Kerne, A., Toups, Z.O., Dworaczyk, B., Khandelwal, M. A Concise XML Binding Framework Facilitates Practical Object-Oriented Document Engineering, Proceedings of ACM Symposium on Document Engineering, Sao Paulo, Brazil, 16–19 September 2008, 62–65. Toups, Z. O., Kerne, A., Implicit Coordination in Firefighting Practice: Design Implications for Teaching Fire Emergency Responders, Proc ACM Computer Human Interaction 2007, San Jose, April 2007, 277–286. Toups, Z. O., Graeber, R., Kerne, A., Tassinary, L., Berry, S., Overby, K., Johnson, M., A Design for Using Physiological Signals to Affect Team Game Play, Proc Augmented Cognition International, Oct 2006: San Francisco. Toups, Z., Overby, K., Kerne, A., Graeber, R., Cooper, T., Alley, E., Censor Chair, ACM SIGCHI Intl Conf on Advances in Computer Entertainment, June 2006, Hollywood. Alley, E. Cooper, T., Graeber, R., Kerne, A., Overby, K., Toups, Z., Censor Chair: Exploring Censorship and Social Presence through Psychophysiological Sensing, Proc ACM Multimedia 2005, 922–929.